If you lost interest in smartphone and tablet chipsets after they passed the dual-core stage, maybe the newest Samsung announcement will bring it back, as it has not two or four, but a full eight processor cores, aptly named the Exynos 5 Octa. The latest member of the 5-series has been done with a 28nm process, and frugality/performance ratio in mind, as the chief of Samsung Electronics Stephen Woo admitted that the task to up performance while decreasing power consumption has been the one bothering him, and keeping him awake at night. With Exynos 5 Octa, Samsung thinks it has cracked that code, and demonstrated on stage how you can search for restaurants and watch an HD movie at the same time, as well as some 3D gaming with Need for Speed: Most Wanted chosen as the demo. "Level of pure processing power, never seen before in mobile devices" and "more detailed damage to cards, then ever before" were just a few of the superlatives thrown at Exynos 5 Octa during gaming. Samsung's peeps said that the new Exynos has twice the graphics performance of anything currently on the market, but it is also very frugal, for up to 70% power savings. It's built around ARM's big.LITTLE concept, with a mix of frugal Cortex-A7 cores for the mundane tasks, and Cortex-A15 ones for the heavy lifting. They showed a chart with performance/power consumption ratios, and, needless to say, the Exynos 5 Octa was top dog there, so we can't wait to see this buddy in phones and tablets, pitted against Tegra 4, and Qualcomm's new Snapdragon 600 and 800 families. Samsung also mentioned that the road ahead includes plans for 20nm, 14nm and even 10nm mobile chipsets, so the good news is far from over in that department. Holy COWWWWW!! Samsung has done it again!! Not so fast, Tegra 4 has 72 GPU core, and it has 1 low power core as well. We know that GPU is very important now as phones and tablets have lots of pixels. We must have a fight btn those 2.
yes, there must indeed be a battle but i have little doubt that this will be the winner. Its extremely hard to beat Samsungs SoC prowess... which is why Apple had such a hard time getting away from them.. and likely wont for another generation or 2. Tegra4 is nice, but Samsung is the leader.. building on a leader's designs. Last year Tegra 3 used 40nm technology while Exynos 4 used 32nm. So Tegra lost the battle. This year both Tegra and Exynos use 28nm process, I actually think Tegra has upper hand as nVidia is very strong in graphics. their GPU's aren't as powerful as the ones by ARM and Imagination Technologies but i do appreciate the optimizations and support Nvidia has with their GPU's. at this point in the game when you're getting more power than you know what to do with that may just be what starts to matter more. It's always a race btn hardware and software, they push each other. Games will be the main beneficiaries from big hardware bump, but there will be new technologies like new camera features... All things point to graphics and I think nVidia is the best in business. But we must wait to see the actual products to know which 1 is better. I went away to another tab and somehow my comment automatically entered. Now I can't edit it again. I wasn't able to put that last period on there and change the one comma to a colon. Excuse the bad grammar. Agreed, but 72 sounds very impressive and is excellent marketing weapon. We have to wait and see how the real things look like. Yes until Intel come up with the power efficient processor. For your information, from A4 processor onward (iPhone 4) Samsung just assembled the processor (Foundry work) Apple design the processor based on ARM Cortex-A8. I was excited that Intel got some new innovations, but now Intel is accused of lying. Things are not looking good for Intel. Well, the leader is actually Qualcomm since the Krait S4 Pro is on EVERYTHING imaginable right now, from Windows tablets/phones, to Android tablets/phones. Look at all the phones that are coming out this Spring. EVERYTHING is S4 Pro. Also Qualcomm will always have a HUGE advantage with their SoC's over Samsung because they are single handedly moving the LTE modem tech forward. Their new LTE modems are incredible. The leader is still samsung, SAE. In total volume, no one touches samsung. And in power, no one touches samsung. I have the Krait Quad pro, I got no issues with it. 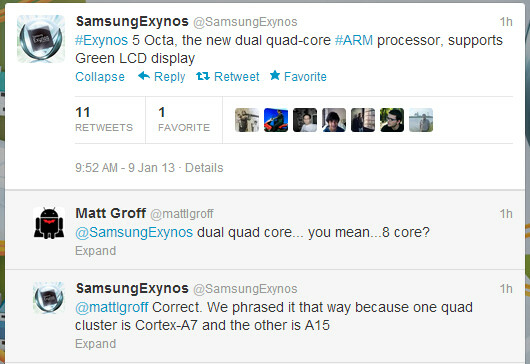 However, it doesnt hold a torch to the exynos 5 quad, nor do I believe it can beat the 5 dual. It doesnt matter how many different devices run qualcomm chips. Sales matter. Samsung makes the majority of android sales.. with their own chips. They also make the tech in every iphone ever sold. Qualcomm is big, but Samsung has like 60% of the market all to itself with exynos and A series. I know in the US the S3's have Qualcomm so I can't say how valid your points are. The bulk of the SGS3's sold in the world are the international Exynos edition. This will be the last year should see any high end samsung products doing the "chip trade out for LTE" like we have the last few times. Except for America and Japan, all samsung high end devices are Exynos. And again, they make the chips for Apple as well which until the A6 have been nothing but rebranded Exynos chips with the PowerVR GPU instead of Mali. The 2 phone manufacturers that take 80% or so of all Smartphone sales (samsung and Apple) use the same Samsung tech in both of their phones. I said Samsung owns probably 60% of the market to make up for the difference due to the Qualcomm chip switch outs in the SGS2 and SGS3. 20% should be more than enough to compensate. In total volume Samsung is pretty much the only Android OEM. Not a reasonable comparison. APQ8064 might equal Exynos 5250. Snapdragon 800 will do battle with Exynos 5 Octa. I don't think normal people will know how that ends until the dust settles and reviews are out. It's not just about Qualcomm SoC. Qualcomm radios run the show. Every iPhone 4S, iPhone 4 CDMA, and iPhone 5 has a Qualcomm baseband at its heart. Samsung may manufacture the Ax series but they have no hand in designing the chips anymore, stop spreading this persistent misconception because I've seen you say it time and time again. go look up what Apples are made out of. Samsung makes a lot more than just "manufacturing the CPU" in an iphone. Most of the internals of an iphone carry a samsung logo. When it comes to radios, yes Q is winning that game. However they are not the only game in town. With samsung finally cracking their LTE/HSPA+ issues with exynos, their need to switch out to Q based radios is drastically decreased. This next generation of phones coming out in 2013 with the new designs will have a big affect one way or the other on who is winning the baseband wars. However, that has nothing to do with the total SoC which is what we are talking about. On that front, Samsung is the clear winner... and growing. Go look at what Apple's SoC design is. Not designed by Samsung. I don't care about anything else, because I'm not dumb enough to try and fight a straw man. Samsung only makes the SoC for Apple, they don't design it. Samsung's Exynos is only in significant numbers on the Galaxy series. wrong troll, I'm actually using a Qualcomm Krait Quad Pro powered Nexus 4. The truth is the truth. this magic genie called "google search" and years of research for my own benefit. And you don't seem to understand no have knowledge that Exynos chips are 25% better than standard commercial CPU that are used typically bye all vendors. We'll see how it stacks up against the snapdragon 800.
what kind of processor did Samsung used for this 8 cored processor? did they used A15 like the ones in Tegra 4? What the heck just happened...I was on this site looking for some CES news from Earth mind you and then I read this! I mean high end consumer laptops dont have ota cores...the come with OC'd quads and this is octa! OCTA in a phone or tablet! I just dont know how to react...I am excited and happy its here and YES I will be getting one of these bad boys....but do we even need these? Are there applications or OSs that even have appas that require such power? Lets just say I was looking forward to Exynos 5 quads and S4 Primes but Sammy has changed the game on its head and blown the competition out of the water! I;ll leave my comments at this for now but if this is any indication of 2013 then its gonna be a helluva year folks!